A while back we covered what tools are good to carry with you on your commute. This month we’ll talk about some tips and tricks for repairs when you don’t have the tools. All of the repair tips mentioned below are temporary, emergency only, and in some cases, barely better than nothing. Use your best judgment before attempting any of these. 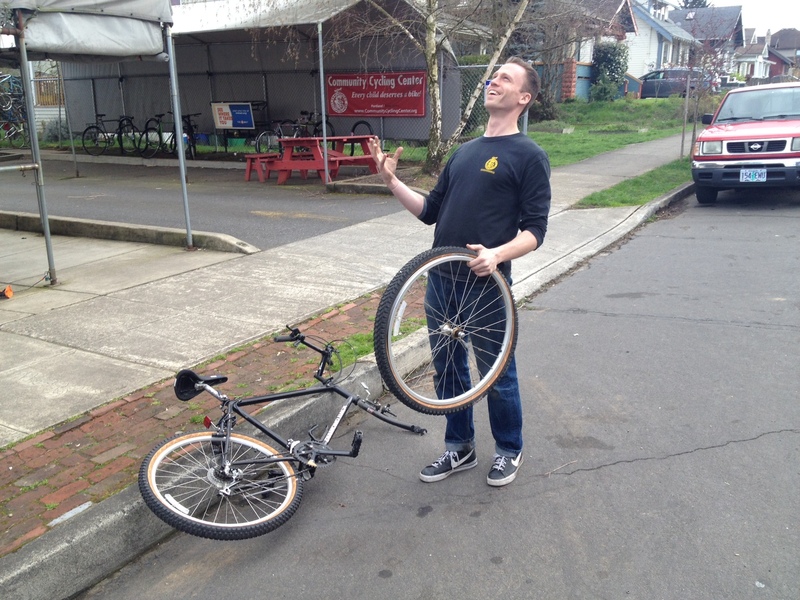 When in doubt, walk home, find a ride, or visit your neighborhood bike shop for assistance. No tire lever? Use your wheel’s quick release lever. Admittedly this doesn’t work all that well, but it can be just enough. No tube or patch kit? Cut the tube in half at the puncture and tie the ends together. Make sure the knot is super tight. You will probably feel the knot as a lump in the tire and you might have to pump it up few times on the way home, but it can be better than nothing. Another tip I’ve heard, but never tried, is to fill a tire as best you can with grass and leaves. It’s better than riding on the rim, but takes a lot of green leafy plants to pull it off. Rip in the tire itself? Use a dollar bill or any metallic wrapper (think a chip bag, shiny plastic is best) as a tire boot to temporarily repair damaged tires. For best results, fold the bill in half twice and center it over the tear between the tube and tire. They’ll be strong enough to take some tire pressure, but not the full 100+psi of a road racing tire. If you boot your tire ride home carefully and replace the tire as soon as possible. I once had a tire rip two inches at the bead when I was 15 miles from the nearest shop and 20 miles from home. I used two bills to boot it, pumped the tire to 1/3 my preferred pressure, and rode the 15 miles to get a new tire. It took a while, but was faster than walking. Really bent wheel? A bent or ‘tacoed’ wheel is more common on a mountain bike than around town, but with rail tracks, it’s a possibility. If you bend a wheel so bad it can’t spin through the frame, you will need a new wheel, but you have one last option to get home. It’s what our mechanic, David Kuch, refers to as “Precision Percussion Alignment.” To pull this off, you will need a good grip and the ground. Hold the wheel with the really bent part out in front of you and smack it on the ground. Start with a light smack and build as needed. Best case scenario, you smack the wheel straight enough to clear your frame, and, at the very least, you might get some frustration out. Ride slow and get a new wheel as soon as possible. Lost a bolt? Losing a rack or fender bolt could cause something to swing into your wheel. Most modern bicycles use just a few sizes of metric bolts. Even if you don’t carry extra hardware, you have some on your bike. On most bikes water bottle cage bolts are the same size as rack and fender bolts. On my touring bike, I’ve gone so far as to use longer bolts on water bottle cages so I know they’ll work for my racks in a pinch. Did it get colder than you expected? This old roadie trick is one of my favorites. If you get caught in colder than expected weather, a layer of newspaper over your chest can make all the difference. Find a Mercury or Willamette Week and put it up your shirt (if it wants to fall out just tuck in your shirt). It’s not very comfortable, and sounds a little ridiculous, but it’s just enough to keep the wind off your chest, keeping you a little warmer. These are just a few of the road side tips I’ve either tried myself or heard from other mechanics. They’re not guaranteed to get you home, but can be worth a try. Always use your best judgment when performing any unorthodox repairs and ride cautiously. The City of Portland bike maps show the location of every bike shop in town. Carry one with you so if something does happen you know which way to walk. If all else fails, Portland has a great transit system. Do you have any tips to share? If so, please share below.